Explain the meaning of the following pottery terms: bat, wedging, throwing, leather hard, bone dry, greenware, bisque, terra-cotta, grog, slip, score, earthenware, stoneware, porcelain, [[w:Pyrometric_cone|pyrometric cone], and glaze. 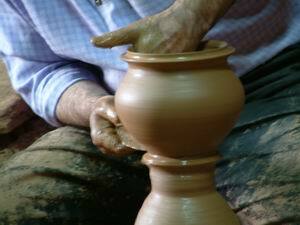 Pottery Merit Badge with Workbook PDF, current requirements, and resources. This page was last edited on 24 September 2016, at 03:49.